In this article I'm going to show a method for automating OSP (RedHat OpenStack platform) deployments. These automated deployments can be very useful for CI, or simply to experiment and test with the system. TOAD: set of playbooks to deploy Jenkins, jenkins-job-builder and an optional ELK stack. This will install a ready to use system with all the preconfigured jobs (including OSP10 deployments and image building). TOAD jenkins-jobs: A set of job templates and macros, using jenkins-job-builder syntax, that get converted into Jenkins jobs for building the OSP base images and for deploying the system. TOAD job-configs: A set of job configurations to be used along with the jenkins-jobs repo. It provides a set of basic configs to build OpenStack using RDO or OSP. TripleO quickstart: set of ansible playbooks, used for building images and for RDO/OSP deployments. One VM to run a Jenkins master + nginx provided by TOAD. If you want to deploy additional ELK stack, you will need extra VMS for ElasticSearch, LogStash and Kibana. For virtualized OSP deployments: one baremetal server, with at least 16GB of RAM and 60GB of disk, multi-core. This will act as jenkins slave, and will hold the virtualized undercloud, controller and compute nodes. For baremetal OSP deployments: same requirement as the virtualized one, to hold jenkins slave + undercloud. Two additional baremetal servers, with at least 8GB of RAM, to act as controller and compute nodes. Please note that the servers acting as slaves will need to have a valid RedHat subscription. If you rely on TOAD, the initial steps will be completely automated. You will need to follow TOAD documentation for the initial deployment. This will create a Jenkins/nginx VM for you, and will enroll one slave as well, configuring that properly. 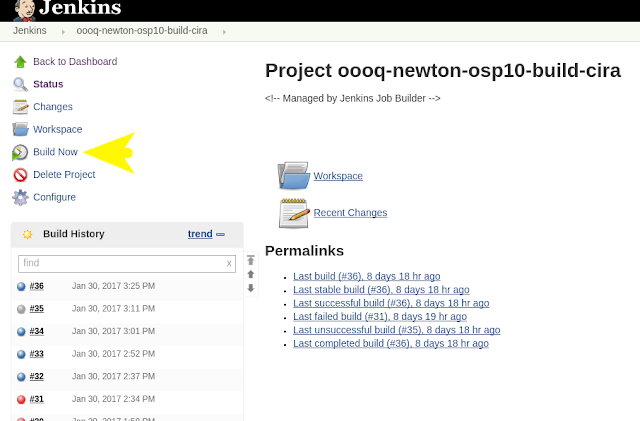 It will also populate all the Jenkins jobs for you, leaving a system ready to use. This will register the Jenkins slave into the RedHat network, and will create a local mirror, with all the needed RedHat repos, that you can use later on your image builds and deploys. For OSP 10 deployments, we better need to rely on RHEL 7.3 guest image. However, the packages are not still providing this version, so we'll need to download manually. In order to do it, open a browser and login into access.redhat.com with your credentials. Then access to https://access.redhat.com/downloads/content/69/ver=/rhel---7/7.3/x86_64/product-software and copy the KVM guest image link into your clipboard. This will make the base image available for the OSP image builds. This process only needs to be done once for each slave you register. In order to deploy OSP successfully, we first need to generate the undercloud and overcloud base images. This can be done executing a pre-configured job, that takes the previous 7.3 guest image, and composes the desired images, to be reused later by the OSP deployments. Please note that this job needs to be executed only once, per each enrolled slave on the system. This job will use TripleO quickstart , along with some playbooks that extend it, to compose the undercloud.qcow2 base image. Overcloud and ironic-python-agent images are embedded inside undercloud image, under the /home/stack directory. When the job finishes, it moves the final images under /home/stack/images/osp<<version>> directory, ready to be reused by the deployment job. Once the base images are ready, it's time to launch OSP deployments. Running it is as simple as executing the right job. In that case, for an OSP 10 deployment you can run the oooq-osp10-osp-deploy-cira job. This will use TripleO quickstart for the deploy, and will rely on the previously generated base images, as well as on the local repo that was created, to launch a successful OpenStack deployment. After it finishes, undercloud and overcloud nodes will be available. So that's it! After following these steps you will have a working OSP on your systems, that you can use for experimenting, CI, or any other purposes. Enjoy! Our image gallery is a wonderful section. View the gallery to see lab, building, infrastructure, employee, students photos. Call for more updates 9310096831.